After appearing to gain momentum in April, recreational boat sales were mixed in May in 27 early-reporting states, a disappointing result for the industry as it tries to climb out of an early-spring slump and repeat the summer gains it achieved in 2013. Statistical Surveys said today that sales in the main powerboat segments fell 2.6 percent, or 339 boats, to 12,658, from the previous May in states that account for 63 percent of the U.S. market. Industrywide sales rose 5.1 percent, or 1,054, to 21,674, largely on the strength of double-digit percentage increases in personal watercraft and ski-boat sales. PWC sales rose by more than 1,300. Sales of 11- to 40-foot fiberglass outboard boats rose 6.2 percent, or 223, to 3,792, but sales declined in the other high-volume categories in the main segments. Sales of aluminum pontoons and fishing boats, which have been industry leaders since the Great Recession ended, were lower. 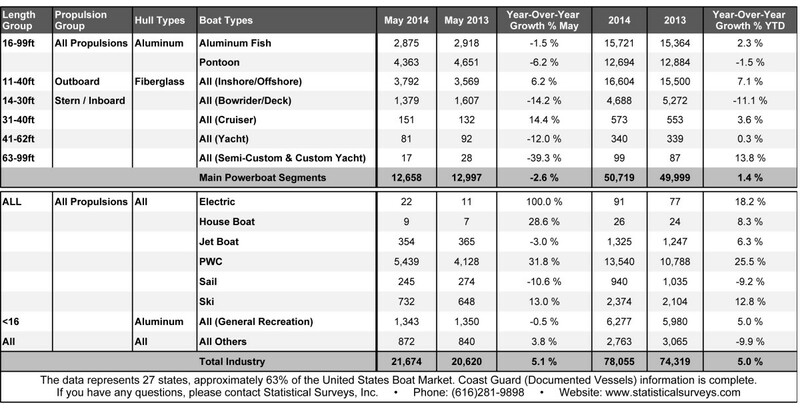 Pontoon sales fell 6.2 percent, or 288 boats, to 4,363, and fishing boat sales were off 1.5 percent, or 43, at 2,875. Statistical Surveys national marine sales manager Ryan Kloppe attributed the slow sales to the lingering effects of the harsh winter that much of the country endured. As states that had a particularly hard winter shake off its aftereffects, “you’ll see some of the [expected] uptick in sales,” he said. Although pontoon sales have slowed this year, Kloppe believes it would be premature to say the segment is losing momentum. He said Minnesota and Wisconsin, two strong states for pontoon sales, were not among those reporting early in May. He expects sales to grow in those states and others during the warm-weather months. Kloppe said he spoke with one dealer in Michigan who said he was flooded with requests from customers near Memorial Day for delivery of pontoons they had bought. Florida, as usual, was the sales leader among the early-reporting states. Sales there rose by 588 boats to 2,857. In an encouraging development, Michigan emerged from the frigid winter to rank second with sales of 2,692 boats, although the number was virtually flat — up just 27 from May 2013. Other states in the top five were Texas (2,524, up 265), New York (1,666, down 190) and North Carolina (1,312, up 176). Rounding out the top 10 were Georgia (898, down 63), Tennessee (887, up 262), New Jersey (768, up 123), Arkansas (744, up 143) and Ohio (730, down 186). More boats were sold in seven of the top 10 states this May than in the same month last year. Sales of 14-to 30-foot sterndrive and inboard fiberglass boats have been slumping, and that category’s struggles continued. Sales for the month in the early-reporting states totaled 1,379 — 6.2 percent, or 288 boats fewer than a year earlier. Sales of PWC, which rose 31.8 percent, or 1,311 units, to 5,439, buoyed the market, as did the ski-boat category, where sales rose 13 percent, or 84, to 732. Sales of jetboats were 3 percent lower, off 11 boats, at 354. Among the low-volume bigger-boat categories, 31- to 40-foot cruisers were the only one that showed a gain. Sales rose by 19 boats to 151. In the 41- to 62-foot yacht category, sales fell by 11 to 81 and among 63- to 99-foot yachts sales dropped by 11 to 17. The Coast Guard was up to date in its reports of documented vessels, providing a complete picture of sales in those categories. Sailboat sales fell by 29 to 245.